Have you ever made homemade croutons? I have and they're delicious! I don't know why, but I'm rather picky about my croutons. I don't really eat them in restaurants but I love my homemade ones. I love that I can control the amount of seasoning and change the flavors depending on what I'm going to use them in. Have you ever had croutons on anything besides a salad? What about in a big bowl of soup or chili? How about just eating them by the handful because they are crunchy, tasty, and you can't get enough? 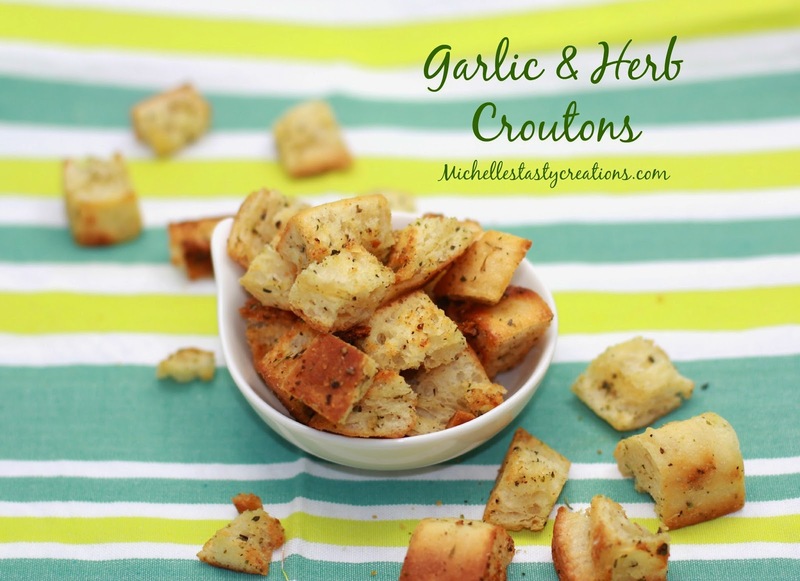 Whatever your reason for loving croutons, you need to make these homemade ones right away! Oh, and they make awesome hostess gifts too! Just put a few cups in a cello bag or mason jar and tie with a ribbon and a card, Voila hostess gift in minutes :) You're welcome! Cube bread into 1/2 - 1 inch pieces and place in a large bowl. Sprinkle the oil and seasonings over the bread cubes and toss until completely coated. Pour onto a baking sheet and spread out into a single layer. Bake for 6-7 minutes then stir really well with a spatula. Bake an additional 6-7 minutes or until golden brown and starting to crisp. They will get crispy as they cool. Serve with your favorite soups, stews, salads, or just eat as a snack.